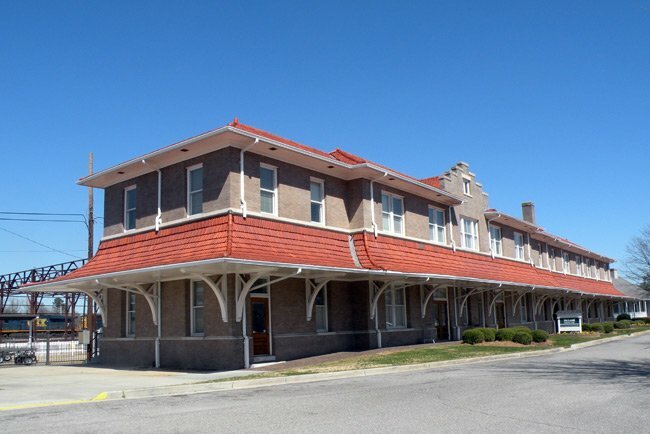 Constructed in 1910, the former Atlantic Coast Line Railroad Depot still stands strong in Florence. 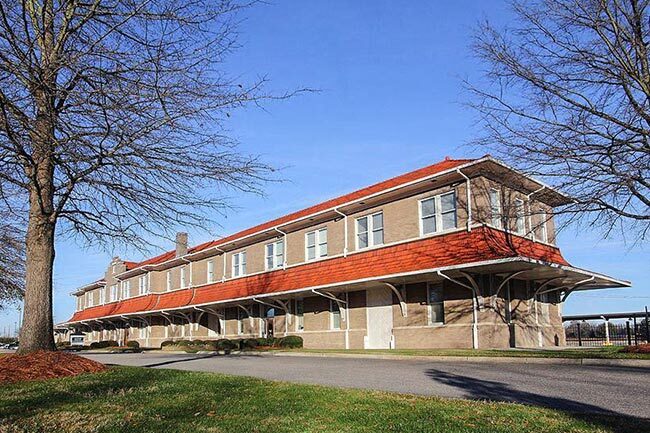 Designed by the official architect for the Atlantic Coast Line Railroad Company, J.F. Leitner, the building also served as the Florence Amtrack Station for many years. Although no longer servicing the rail lines, the depot has been renovated and is now used as offices for McLeod Regional Medical Center. A newer depot is located next door which handles passenger rail traffic for Amtrak. Multiple track lines, now owned by CSX, are still located behind the former Atlantic Coast Line Railroad Depot. One of my most fond childhood memories was coming here just before Christmas and picking up a friend of my fathers’ employer. We lived in Myrtle Beach, a sleepy little town, especially in the winter during the early 60s. We would drive here early on a Saturday morning, come into the station and check to see if the train was on schedule. I remember the entry doors seemed so HUGE to me, a little boy of 9. And the echo of voices in the terminal. We would check the arrival time, then leave and drive to Treasure City, the department store near the airport, and look around in there. What fun!! So much to look at and want!! Sometimes Dad would buy me a little something even tho it was so near Christmas.Then, back to the station, and recheck the arrival time. Then, across the parking lot was a restaurant where we would go for lunch. Another treat!! Usually we would both get the meat and three.Very good! And back to the terminal. This time we would wait. When the time of arrival came close, we would walk out on the platform, Dad clutching my hand, and check if you could see the train– and suddenly you could see the lamp on front of the train way off in the distance, toward Pee-Dee. I would get a shiver,and would brace myself for the loud noise and thundering beneath my feet. Soon it came, my eyes transfixed on the HUGE green and gold locomotive, bell clanging and so many other hissing, scraping, bumping, screeching, wonderful sounds. And the platform would be shaking and also you could feel the noises within your body. WOW, very cool! I will never forget these trips up to the Florence Train Station.